excite him as much as they did his predecessors. Besides, money means little to him. Whether it is making it or possessing it. He always puts his country first. He is unselfish. Combine this with a genuine warmth for people (strong Venus), a reasonable attitude and lack of stubbornness (thumb), and you have a person who is willing to see another point of view as long as it does not directly clash with his principles. There have been accusations that his compassion for people is fake, but his hand shows that this is not true. Not only does he love people, he has genuine sympathy for the suffering, a humanitarian type of mind-set. He is not that good as an “executive” though, if one looks at it in terms of "efficiency." It is likely that Jiabao would find it difficult to implement some of his plans as they may not be practical. Plus, he is cautious, even hesitant when it comes to action, although he has independent views. However he more than makes up for this lack by his power of expression and use of extravagant words. In this sense he is a typical politician and perhaps this is why some people do not trust him. This does not mean that he is incapable. On the contrary, he thinks quickly, and at times acts quickly. Particularly when it comes to issues of less import or those which he feels will make him look good. His mounts and fingers show that he is a calm person, with just the right amount of aggression (Mount of Mars) and he is not easily persuaded out of his pet beliefs. He has discipline and control. All is not perfect with his personality though. He has manipulative abilities which he will use to keep himself in power (Jupiter finger) and again, this is typical of many a politician. He is also a very shrewd person and will not approach issues directly. He is likely to overestimate himself and enjoys being in the limelight. He likes power, and believes there is nothing wrong with keeping the hotseat as he is the best for the job. (Wen Jiabao is the sixth and current Premier of the State Council of the People's Republic of China, serving as China's head of government and leading its cabinet). You might also like to read The Dalai Lama's hand analysis or other hand readings on those from China or all Politicians. Or you can find out what the hands of Heads of States from different parts of the world tell you about their personas. Are the rules of the lines common across all cultures. 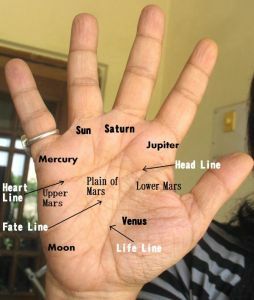 Our thoughts and attitudes surface as lines on the hand from which a palmist will draw conclusions. Hence will an "indian" hand be different from say an "occidental or oriental" hand? Anil, sure, the rules of the lines are common across all cultures. But Indians hands are different from western hands as temperaments and talents tend to be different. It is temperament and talent that is shown on the hand. From my own experience of reading hands of famous people,if I take just people in the political arena, I find that politicians from western countries are far more straightforward, honest and upright than Indian politicians. However this does not mean that this is a difference in the western people and the indian people. Honest, upright and principled Indians are rarely found in politics.